After a lot of work, we finally got these results off my bench and into the literature. In our new article in “Chemistry – A European Journal” (Wiley), we present a convenient one-pot approach to synthesising chiral bis(triazolyl)pyridine ligands from enantiopure amines with the stereochemistry retained. This approach is broadly applicable. The beautiful mirror-image crystal structures were obtained by Dr Miguel Martínez-Calvo (now in Santiago) and show interesting supramolecular hydrogen bonding interactions between the ligands which we will exploit in the future. Dr Bob Peacock in Glasgow performed circularly polarised luminescence spectroscopic measurements on the coloured lanthanide(III) complexes of these ligands, illustrating their optically active nature. In this article, we were able to show interesting behaviour which has only really been studied so far by researchers in Prof Thorri Gunnlaugsson’s lab (with two other examples published recently in projects led by Dr Oxana Kotova and Sam Bradberry, respectively). This behaviour was the notable changes in the circular dichroism (CD) spectra of these chiral molecules upon addition of lanthanide(III) ions. These spectral changes could be fit to determine binding constants of this self-assembly. These clear chiroptical spectra are in contrast to a dissapointing aspect of results we published earlier this year in Inorganic Chemistry (with remote amino acid substituents giving rise to weak CPL and CD) and shows that placing the chiral centre nearer to the metal ion binding location enhanced the effect on the chiroptical properties of such systems. I really enjoyed going back to my alma mater to share some research, but also to lead delegates on a unique kind of walking tour. Not every chemistry conference comes with complimentary ghost stories! The majority of the research group attended the Irish Universities Chemistry Research Colloquium in Maynooth University on 25-26 June, many presenting posters over the two days. Sam Bradberry gave a talk presenting his work on polymeric soft materials, including hydrogels and luminescent logic gate mimic systems. This prompted some discussion from the audience. 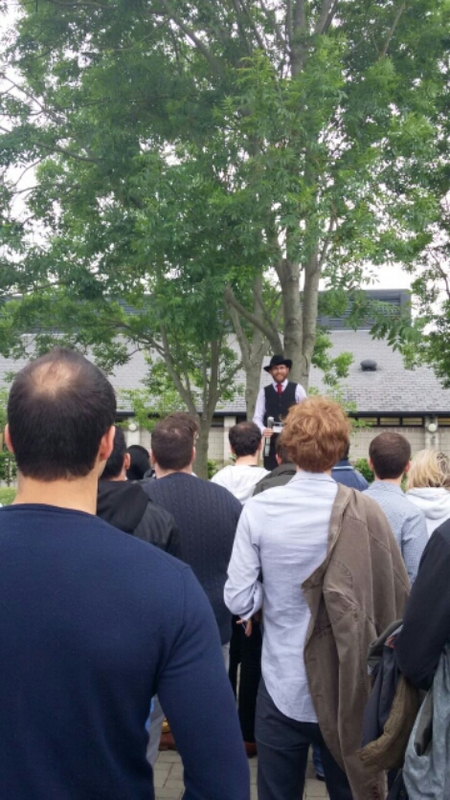 In the evening, Joe Byrne – a Maynooth alumnus – led the delegates on a walking tour of the historical campus, telling ghost stories he collected from staff during his undergraduate studies there. This alternative conference entertainment was enjoyed by those who attended.